Addition is probably the most basic and important math concept that kids learn. When kids learn to add at an early age, they establish an important foundation that will allow them to learn more complex math concepts and tackle more difficult problems. The collection of cool math games in the virtual world here at Math Blaster includes fun-filled addition games. Players can create an avatar, join the Blaster Corps and solve addition problems to gain points and move ahead in the game! 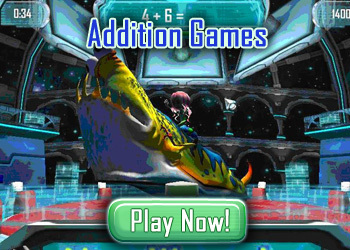 Add more fun to learning math with fun online addition games. From simple addition problems to tougher ones, there are all kinds of problems that kids have to solve in order to advance in these games. Interactive and engaging, these addition games for kids make it easier for them to grasp and practice the concept. Most kids love to spend their time playing online games. The internet has an exhaustive collection of educational games that parents and teachers can engage kids with to ensure that the little ones are spending their time productively. A great resource and an effective teaching aid, online addition games give kids the opportunity to practice their addition skills as they play exciting math games. The virtual worlds at Math Blaster and JumpStart are filled with a wide array of addition games. Each of these online worlds is designed to blend learning and entertainment to keep kids engaged with concepts like addition! So get the learning started with our cool addition games. Don’t be surprised if the little ones are soon addicted to addition!